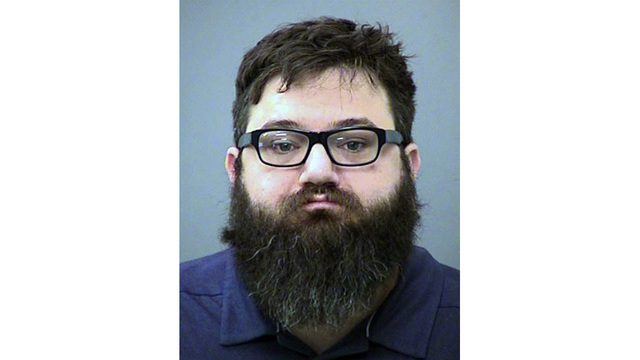 INDIANAPOLIS (AP) - An Indiana man charged in the road rage shooting death of a Muslim man allegedly yelled "go back to your country" and made ethnic and religious insults against the victim before the shooting, according to court documents. Dustin Passarelli, 33, of Plainfield, remains jailed without bond following his Friday initial hearing on a murder charge in Zahra Ayoubi's killing. A preliminary autopsy showed Ayoubi was shot once from the front in his shoulder and seven times in the back Saturday outside an apartment complex where Passarelli had followed him after the two crossed paths on Interstate 465 in Indianapolis. Passarelli told investigators he was driving when another car aggressively "flew up" from behind and he followed it to the apartment complex's parking lot, where there was a verbal altercation between the two men, a probable cause affidavit states. Passarelli, who is not Jewish, told officers Ayoubi made an anti-Semitic remark to him and punched a window in his car twice, cracking the glass. He said he was in fear and pulled a handgun from his seat and shot through the car window. But a friend of Ayoubi's told investigators he heard Passarelli yell "go back to your ... country" at Ayoubi using an expletive, and also make ethnic and religious insults before the shooting. A message was left Friday seeking comment from Passarelli's court-appointed attorney. Ayoubi's sister, Zahra Ayoubi, said her brother's death should be investigated as a hate crime. She also called on Indiana, one of five states without a hate crime law, to pass its own hate crime law. "It was a hate crime," she said prior to Passarelli's Friday court hearing. Marion County Prosecutor Terry Curry noted Indiana's lack of a hate crime law Friday in a statement where he said his office "will vigorously prosecute to seek justice for Mr. Ayoubi, for his family and loved ones, and for all members of the Hoosier Muslim community who have been impacted by this tragedy." "While the disturbing allegations underlying the charge in this case remain to be proven at trial, we are obviously unable to charge this alleged act as a hate crime," Curry said. Grant Mendenhall, special agent in charge of the FBI in Indianapolis, told The Indianapolis Star that the FBI is monitoring the investigation into Ayoubi's death. The Indiana Senate passed a hate crimes bill Thursday, two days after it was amended to remove a list of specifically protected characteristics, including sexual orientation, gender identity and race. That bill now heads to the Indiana House. After the bill was stripped of those protected characteristics and approved Tuesday, Republican Gov. Eric Holcomb, civil rights activists and business interests criticized lawmakers' move. Holcomb, who supported the original legislation among his legislative priorities for the 2019 session, said the amended bill "does not get Indiana off the list of states without a bias crime law." Arkansas, Georgia, South Carolina and Wyoming are the other states without hate crime laws.